Running in the mountains with exposed ridges in an electrical storm is never advised. But so is running a 100 or 50 or 34 miles at one time. That’s why we’re ultra-runners, we do this kind of stuff. The most dangerous situation we have on the course is lighting. In the past we’ve experienced life threating storms to aid station personal and runners on exposed ridges. Scary doesn’t describe the terror that occurred up at Snow Valley Peak that day. Race management constantly monitors thunder storm activity during the race with sophisticated weather radar apps. 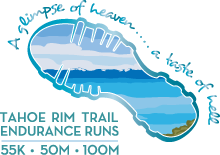 We will advise aid stations in the vicinity that there is a possibility of thunderstorms between the next aid station and for runners to proceed with caution. Please be prepared with proper clothing like a light pack away jacket. In a thunder storm with hail you can get hypothermic almost immediately. If the radar is showing imminent thunder storms with super cell capabilities at the race directors’ discretion the course may be shut down for the safety of the runners and aid station personal. If this should occur, aid station personal will be directed to seek shelter in their vehicles . If you come to an aid station where this has occurred, DO NOT seek shelter under the large tents on course. They have metal frames and will conduct electricity. If you are caught in a thunder storm with lighting close to you, you should immediately head to lower ground. Seeking shelter under a tree is not safe as the tree may be struck and you would be in danger of falling limbs or electrocution. If you are on a ridgeline it is recommended that you get at least 200-500 feet lower to reduce the risk of being struck. The race management will do its best to keep you as safe as possible or informed of possible thunder storm activity. Ultimately it is up to you to care for yourself and make smart decisions as to seeking shelter or keep moving on. The race has a 35 hour cut-off which is ample time to wait out a storm in a safe zone and still finish. A finishers award is not worth risking your life if you are struck, which would likely kill you or cause sever life changing injuries.